Disclosure: We received some of the activities and items recommended below as discounted or complementary in return for review and some we have paid for. 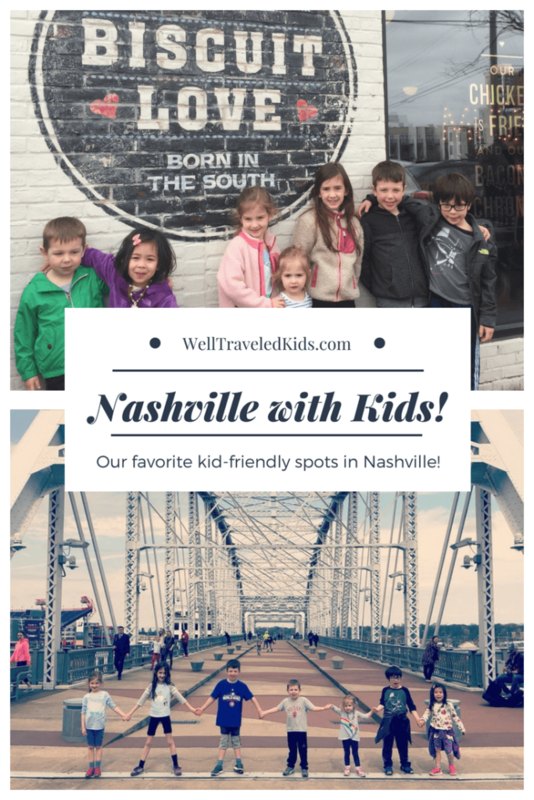 In all cases, the opinions are my own and this list is really our absolute favorite must do list for Nashville with kids! 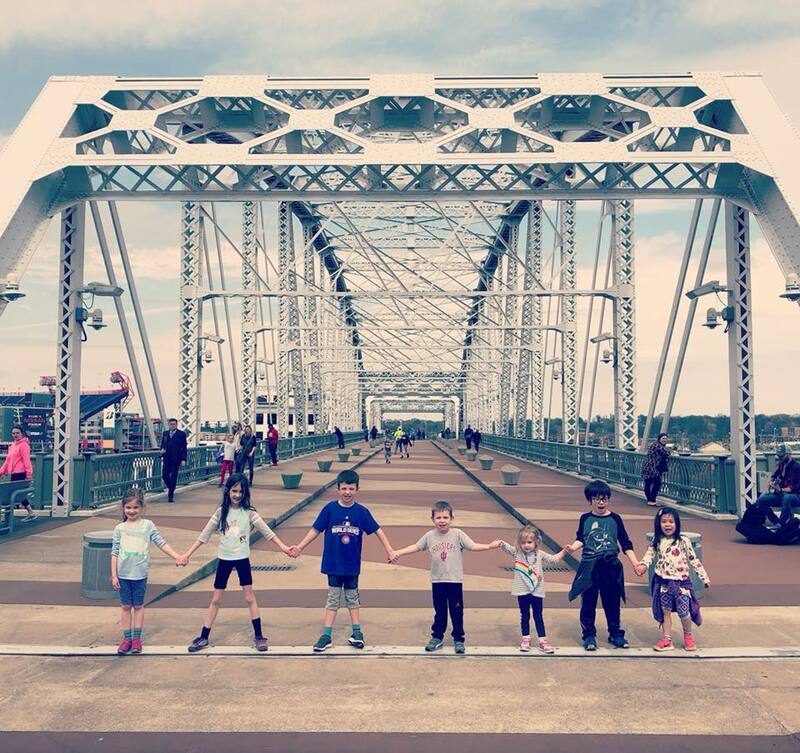 What does a city nicknamed “Nashvegas” offer kids? We headed to Nashville this past March to answer that very question. Our crew consisted of three families – 6 adults and 7 kids ranging in ages from 3 to 8. All of us were ready for a Nashville family adventure! We arrived committed to experiencing all that makes Nashville a unique city both with and without kids. Over the course of three days, we put Nashville to the test! 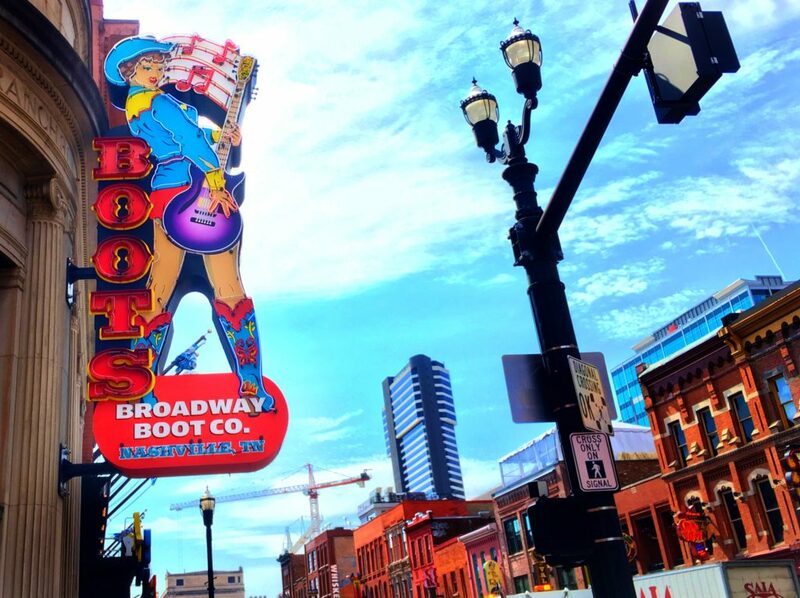 Honky-tonking our way along Broadway (The Strip) and eating our way through the city – all with the kids in tow. And, let’s just say, Nashville in all it’s southern charm and glory did not disappoint. Checking out the live music scene is a must, but it can be challenging with kids. It turns out Broadway is surprisingly kid-friendly during the day. We spent an afternoon strolling up and down The Strip checking out different bars and live music joints. My favorite with the kiddos was Tootsie’s Orchid Lounge, one of the oldest establishments on The Strip. Because it’s so famous, it’s always crowded, but we were able to get a few tables in the back for the kids to hang out and eat lunch. The menu is perfect for children – burgers, chicken tenders, fries, etc. And, the multi-level structure (there are musicians performing on every floor), old pictures of past performers, and tabletop carvings gave the kids plenty to see, do, and explore. Plus, the rooftop bar has some great views of The Strip. Insider Tip: Don’t feel discouraged if the first floor is too crowded. When we were there, the upper floors were a lot less crowded and had a lot more room and space for kids. Insider Tip: The best time to visit with kids is before 6 pm. 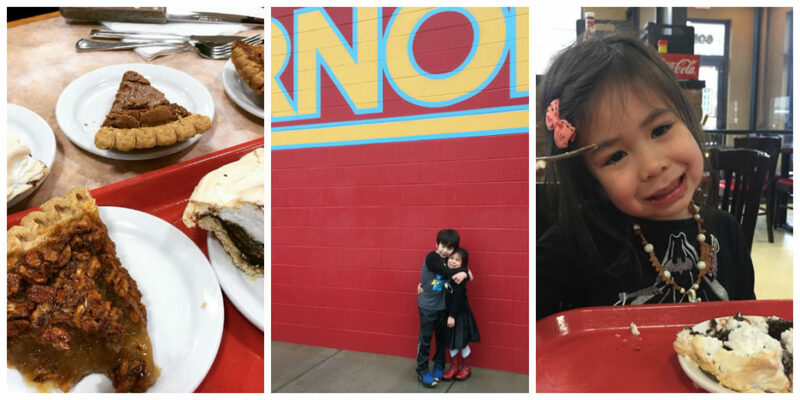 Although the focus of this post is Nashville with kids, we were lucky enough to sneak in a few grown-up nights. I had the most fun exploring the local bars and music scene off The Strip. 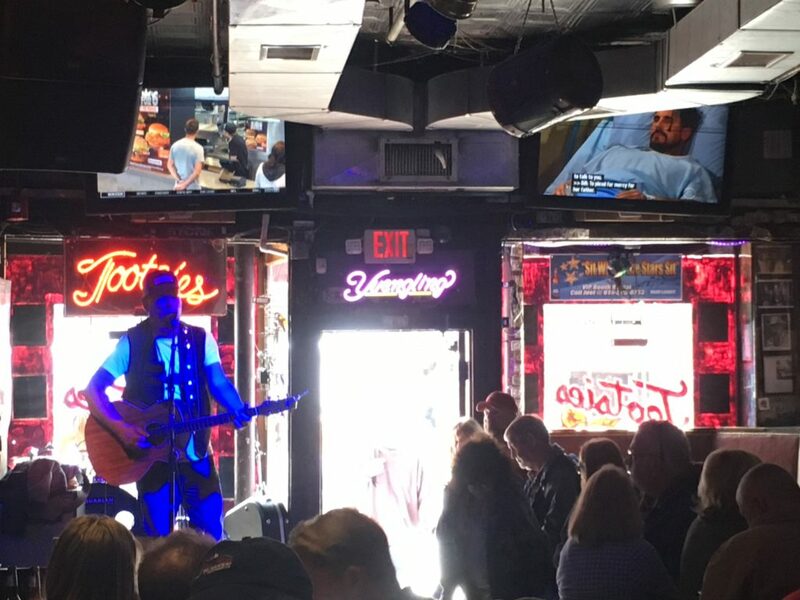 So, it’s only natural that in a post that features the country music capital of the world, that I comment on my favorite place for live music without kids. The 5 Spot is a local dive bar in East Nashville, known for their Mo-town Mondays. We were there on a Wednesday so we missed the Monday night dance party, but the atmosphere was low key and friendly and the bands, who were nothing short of amazing, played a variety of music. If you can swing a grown-up night’s out and are looking to hang with the locals, check out The 5 Spot. Visiting Nashville isn’t just about about experiencing live music in its current format, but learning from the music legends who have left a significant imprint on the music industry. That’s where the Johnny Cash Museum and Patsy Cline Museum come in. While separate museums, they are housed in the same cozy building just off The Strip so it’s easy to hit both at the same time. Plus, the museums are compact enough that you can visit both in about an hour or so – perfect for smaller attention spans. The museums feature an extensive collection of artifacts and memorabilia from both artists’ careers and personal lives bringing a distinct level of intimacy to the museums. 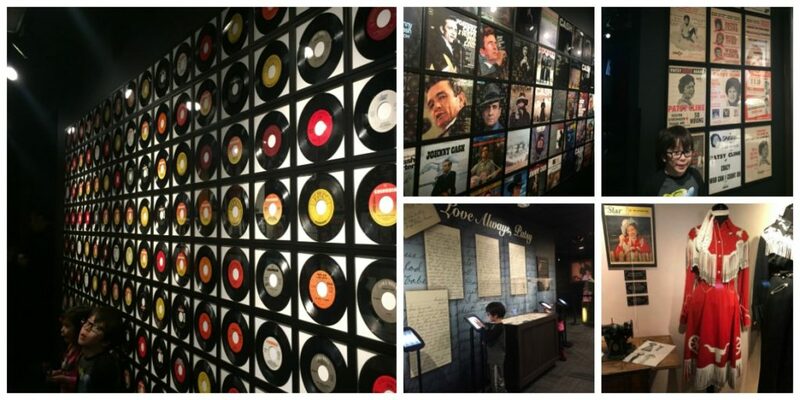 The Johnny Cash Museum features personal items such as report cards and class pictures, documents and uniforms from Cash’s time in the Air Force, and even gifts that Cash and June Carter exchanged as well as Instagram-worthy exhibits featuring Cash’s 45 rpm singles and vinyl LP albums. My kids loved the interactive aspects of the museum such as the listening booths, the photo area, and the video rooms. The Patsy Cline Museum, which opened in 2017, also features many personal items from the star’s life and music career. My kids loved seeing the recreation of the ice cream parlor where Cline worked as a teenager and the numerous stage costumes that her mother made her during her early years. And, I couldn’t help swoon over the mid-century dining and rec rooms recreated from Cline’s dream home. I had no intention of buying cowboy boots, but I immediately fell in love with the city’s southern charm, vibrant energy, and even it’s urban hipster cowboy vibe. And, of course my shoe-obsessed daughter noticed everyone wearing cowboy boots on The Strip and was begging for her own. So, after being in town for less than 24 hours, I walked into Boot Country where you can by 1 pair and get 2 free! Brunch is pretty much all Biscuit Love does and boy, do they do it well. They have three locations (we visited the one in Hillsboro Village) and when we got there at 9:30 on a Tuesday, a short line was forming. By the time we left, the line was down the building and around the corner. According to their website, the line can take 50 minutes to an hour on weekends so come early and be prepared to wait because it doesn’t let up until after lunch (and closes at 3:00). Bonuts – like a donut but with fried biscuit dough served with cream and fruit compote. The bonuts are made fresh every day so when they’re out, they’re out. Another reason to come early. The East Nasty – A biscuit with fried chicken and sausage gravy. Soooo good. I literally crave this every day of my life, but especially after a late night out. The Princess – A spicy version of the East Nasty which is just as delicious. Insider tip: Biscuit Love characterizes themselves as a fast casual restaurant – order at the register, grab a number (and a seat), and your food will arrive at your table. If down-home southern home cooking is your thing, Arnold’s has been a Nashville staple for more than 30 years. Housed in an unassuming concrete building, Arnold’s is known for its cafeteria-style format and “meat and 3” option. Like Biscuit Love, the key is to arrive early (before 11:30) to beat the lines. In addition to the roast beef and fried chicken, they’ve got a TON of sides and desserts to choose from. Think green beans, mashed potatoes, fried green tomatoes, creamed corn, and mac and cheese. And . . . chocolate chili pie, pecan pie, and banana pudding. While the food is as authentic as you can get, my favorite thing about Arnold’s was the sweet authenticity of the people behind the counter. Even during the busy hustle-and-bustle of a cafeteria-style restaurant during lunch, they had patience with the kids who were curious about every single item of food and took their sweet time to choose the best piece of pie. We headed to Centennial Park one morning after breakfast to let the kids burn off some energy. Centennial Park occupies 132 acres with fair grounds, a lake, race tracks, sand volleyball courts, and most notably – a life size replica of the Parthenon in Athens (possibly the strangest tourist attraction in Nashville?). Built in 1897 as part of the Centennial Exposition, the Parthenon was originally created as a temporary structure to celebrate Nashville’s position as the “Athens of the South”. The citizens loved the Parthenon so much that it was rebuilt as a permanent structure and now houses a museum. Nonetheless, it’s still an odd thing to see in the middle of Music City and thus, a must-see attraction. But, there’s so much green space and it’s so close to the downtown area, that it’s really a great place for kids to let off some steam. Hands down, the best place for picturesque views is the John Seigenthaler Pedestrian Bridge. 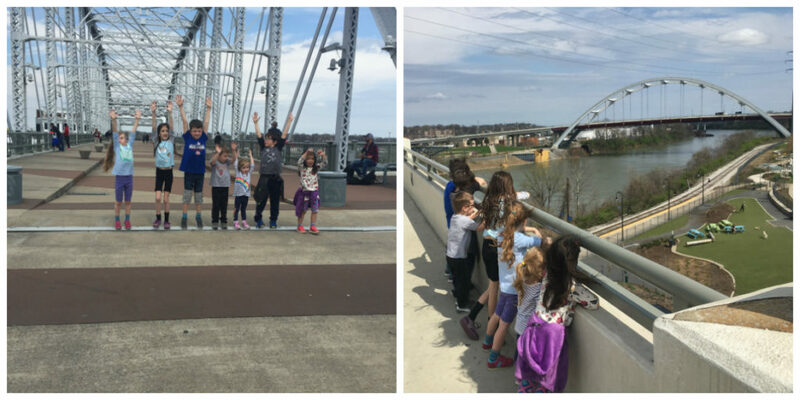 We stumbled upon the bridge during one of our walks along The Strip (the bridge is at one end of The Strip and connects the downtown area to the East Nashville neighborhood). After spending a couple of hours on The Strip, the bridge was a nice reprieve from the hustle-and-bustle and since the bridge is closed off to traffic, it provided ample opportunity for the kids to run around a bit. It’s inevitable that after a few days of late nights and no naps, a meltdown is going to occur with the littles. When it did, we were lucky enough to be spot GooGoo – a small candy and ice cream store located across from the Johnny Cash and Patsy Cline Museum. While the ice cream selection (and the seating is limited), it was the perfect antidote to take a break, grab a snack, and regroup before we moved on. Plus, there’s a bit of history here. It turns out that the GooGoo Cluster was the first combination candy bar ever invented and mass produced. Prior to the GooGoo Cluster, candy only consisted of one primary ingredient (taffy, chocolate, caramel). Thanks for a perfect family adventure, Nashville! ‘Till next time! Special Thanks to my friend Kelly Asseff for letting me include some of your lovely photos into my post!